When you Backpack Uruguay you are able to explore the true beauty and natural wonders of this South American Country and other Latin American nations. Instead of always staying at hotels or renting a private apartment with a backpack you will be free to wander the pathways that are far less traveled. With low stress, low cost and unlimited adventures it is little wonder why those who backpack Uruguay are so enthusiastic about this relaxing type of vacation getaway. South American countries such as Uruguay are able to give tourists a wide variety of vacation adventures. Some people will want to reserve rooms at upscale resorts and hotels and others will check to see which of the chain hotels and local lodging accommodations might offer the cheapest rates. There are others who will want to embrace the culture and history by setting out on a backpack Uruguay adventure. When you Backpack Uruguay, there is an opportunity to make your vacation more memorable. You can create an itinerary online that provides you with a schedule of stops throughout the country or just set out on a whim and travel in whichever direction the wind blows. You can camp under a starlit sky, rent a small beachfront cabana or simply stay overnight in budget hostels. Remember that you are in charge of your backpack adventures. Backpacking in Uruguay will open up many adventures that you might not experience otherwise. For instance you can choose a low key trip to Punta del Diablo. This town was once a small fishing village and today much of its charm has been retained. There is a popular Uruguay beach that caters to the typical tourist crowd but as a backpacker you can avoid this area and explore many other local Uruguay beaches instead. 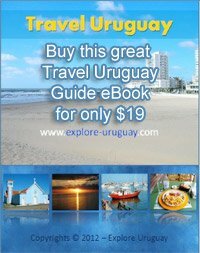 Being able to explore the smaller and more rustic settings lets you experience the real culture and native atmosphere that makes Uruguay such a unique and delightful South American country. You can always set up camp near the Atlantic Ocean and watch the surging waves crashing against the rocky cliffs. No music on earth is as wild and fiercely hypnotic as the sounds produced by the sea. filled with stars will be the canopy under which you will sleep. If you travel just a few miles to the south from Punta del Diablo you will be able to visit the national park of Santa Teresa. This is a hike that may take you several hours but the scenery along the way is well worth the effort. You can always hire a taxi or travel by motorbike but if you are already backpacking in Uruguay why not add this side trip to your schedule? Many people who have enjoyed backpacking in Uruguay have found that a tour of the Santa Tereza Fortaleza, the nearby Uruguay beaches and the rolling hills make this park one of the best destinations for any backpack enthusiast. As a backpacker and hiker you are free to set your own schedule and you can make your Santa Teresa stay as long or as short as you like. Uruguay has campgrounds for the public set up in many areas of the country. There are sites located along the beaches of the river as well as those that are near the Atlantic coastline. No matter where you want to travel to or what you want to see, backpacking in Uruguay is an ideal way to enjoy the journey.